Porsche is a company that draws on innovation: And now it is establishing an “innovation office” in Israel. By setting up the office in Tel Aviv, the German sports car manufacturer intends to guarantee access to technology trends and talent. As the first step, Porsche has invested an eight-figure sum in the Magma and Grove venture capital funds. Further investments in start-ups and funds are planned. “Israel is a key market for IT experts and engineers. It has more start-ups per capita than any other country in the world. This talent and technological know-how coupled with the great expertise offered by our employees creates the ideal breeding ground for future business models”, says Lutz Meschke, Deputy Chairman of the Executive Board and Member of the Executive Board for Finance and IT at Porsche. He adds that close collaboration with Israeli experts is necessary so that the company can quickly assess new technologies, develop good relationships and pilot appropriate solutions. The Magma Venture fund invests since 1999 and is currently focused on artificial intelligence and automotive. With investments in numerous successful start-ups like Waze, Magma Venture is one of the major venture capital funds in Israel and has 600 million US dollars under management. Established in 2015, Grove Ventures is a venture capital company with a volume of 100 million US dollars. Its primary early stage investment areas are the Internet of Things (IoT), Cloud Technologies and Artificial Intelligence. “Innovations have to come from somewhere. They need to be developed systematically, which is why we are starting to open up: It is both desirable and essential for us to welcome inspiration from other industries. That’s why we are working together with start-ups, but also establishing partnerships with other companies and the scientific community as well as investing in funds that are relevant to our sector”, says Meschke. Examples of this approach include the investment that Porsche Digital GmbH has made in the start-up Evopark, as well as the collaboration with the HHL Leipzig Graduate School of Management or the involvement in the venture capital firm e.ventures. In the past year, Porsche launched several major projects to promote digital transformation. They include Porsche Digital GmbH, which was founded in June 2016. Headed by Thilo Koslowski, who spent 20 years at Gartner in Silicon Valley, this Porsche subsidiary identifies and develops digital customer experiences, products, business areas and processes. Porsche Digital, Inc., a subsidiary of Dr. Ing. h.c. F. Porsche AG and affiliated company of Porsche Digital GmbH, recently opened a site at Santa Clara in California. The German sports car manufacturer has also been operating the Porsche Digital Lab in Berlin since September 2016. Its purpose is to identify and test innovative information technology solutions. Each of these investments is based on a process of digital transformation within the company itself, which aims to modernise workplaces and organise processes more efficiently. 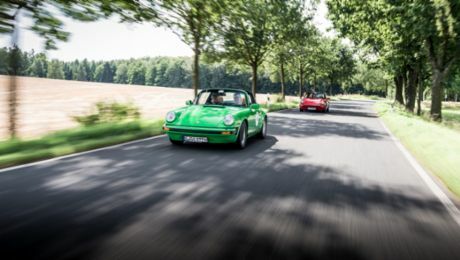 Work is also being done inside Porsche to drive forward a cross-departmental innovation management system, as well as a systematic process of gathering and promoting ideas.